The Washington Nationals' Bryce Harper sits in the dugout prior to a spring training matchup with the St. Louis Cardinals at Roger Dean Stadium. On Thursday afternoon, Bryce Harper signed with the Phillies. Hey @Bharper3407, let me know if you wanna split an apartment in the city. The Phillies fans seem to be taking it well! What do reporters and media types (and even other players) have to say about the deal? Excited for Philly fans to herald Bryce's signing with the grace and humility they're famous for. J.A. Happ after hearing Bryce Harper, age 26, is getting a 13-year deal: "Hm. I was trying to get somebody to sign me through until I was 39." 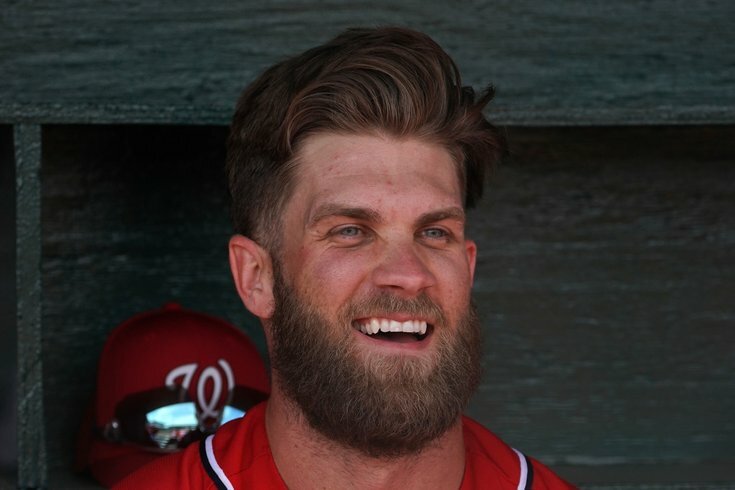 You can make a baby tonight and invite Bryce Harper's current contract to the bar mitzvah. Just talked to Max Scherzer who twice had an excited grin when thinking about facing Bryce Harper in a Phillies uniform. They should square off in the sixth game of the season in Washington. Mark your calendar. The best part of it all, frankly, is that the wait is over. The Phillies open the regular season at home against the Braves on March 28.